Full unused mint condition sheet of Disney stamps in the Art of Disney series. 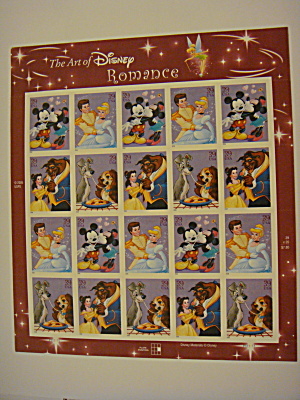 20 39cent stamps This one is Romance, depicting Mickey Mouse and Minnie Mouse, Cinderella and Prince Charming, the two dogs from Lady and the Tramp, and Beauty and the Beast. Published in 2006.